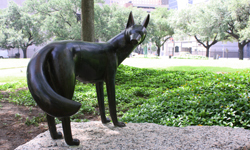 The Three Coyotes, and the fountain around them, were dedicated on September 17, 1992, by Hugo Victor Neuhaus, Jr., in honor of his parents. He felt that they represented the lifelong commitment of Hugo Victor Neuhaus, Sr., and Kate Rice Neuhaus to the culture of Houston. 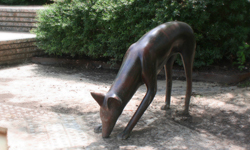 California sculptor Gwynn Murrill created a grouping of three sleek, stylized coyotes, each with its own pose, of bronze. They were placed around the fountain by landscape architect John Cutler of the SWA Group. The fountain was restored in 1997 and is maintained by the SOS! Program.